Dance photography books at their best can convey the mystique of a particular company or the artistic essence of a dancer in performance. Some specialists in the field like George Platt Lynes, Harvey Edwards, Martha Swope, and Lois Greenfield have even have been able to convey the visceral energy of a body in motion, most often with the photographer’s own aesthetic an equal element. Photographer Henry Leutwyler though busts through the staid conventions of dance photography with a remarkable photo study in his book simply titled Ballet. It documents the day-to-day life of the New York City Ballet’s dancers. This bulky folio-style volume does not look like any dance photography book I’ve ever encountered, outside of private collections. The four sections of caption-less photographs chronicle the grueling daily regimen of a ballet dancers’ life with photos shot in NYCB’s rehearsal studios, dressing rooms, storage areas, and cold backstage enclaves during performances at Lincoln Center. There are grainy black and white studio shots of dancers learning new choreography, executing unglamorous floor work, and looking both focused and distracted. Some of the most revealing photos are those of the dancers just inches from the stage, tensely waiting to go on and with expressions nervous tension, if not performance anxieties. The sections of performances are just as unique. Ballerinas en pointe in shadowy silhouettes and architectural bodylines revealed in some black and white studies are intimate moments that usually only the dancers themselves would view. Luetwyler’s lens seems to be in the air with the group of dancers slicing through the air in an arc of a group jeté for an illusory study of suspended animation. Some posed shots of the physical cost are a reality check to the theatrical magic. A ballerina’s one foot perfectly en pointe in a toe shoe and the other foot showing the bare reality of her bruised bandaged and bloody toes. Indeed Luetwyler’s collection is the bare bulb chronicle of a ballet dancer’s regimen that includes pain, disappointment, and sheer willpower to practice an art form no matter the personal cost. But Leutwyler's most fascinating images are his color stage shots of the performances from backstage vantage points. Leutwyler's penchant for blurred images of the dancers on stage creates a painterly and impressionist effect; others project an abstract realism. Some of them are overdone in a movement haze of color saturation and refracted light, but have a magical in the performance moment quality. The effect of the intense activity swirling around in performance scenes from Serenade and A Midsummer Night’s Dream, that are brought down to earth by the dancers’ clustered in the wings or collapsed on the sidelines are studies in their shared physical, emotional, and artistic experience. Studies ultimately of theater atmospherics and physicality of dancers below the surface beauty. 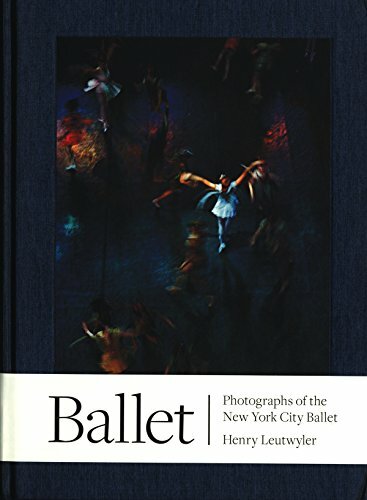 If there is one criticism of this book is that there is not further technical annotation by Leutwyler other than a short noting that he uses the Leica camera that he used “during my seminal years” photographing the Bejart Ballet Lausanne, to capture “moments ranging from the impossibly sublime to the beautifully mundane.” Aside from that, this is a penetrating and unique achievement that pushes the art of dance photography in new directions.